PHOENIX, Arizona – Cutter Aviation has taken delivery of its twentieth HondaJet business jet. The innovative light-jet was officially handed over during a delivery ceremony on November 14, 2018 at HondaJet headquarters in Greensboro, North Carolina by Peter Kriegler, Honda Aircraft Company’s Director of Sales for the United States and Canada. This particular HondaJet delivered to Cutter Aviation includes the new performance package Honda Aircraft Company announced earlier this year, which include shorter takeoff field length, an increased maximum takeoff weight and more mission capabilities. The package also features many Garmin G3000 avionics software updates that enhance safety. 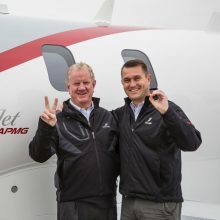 The company’s new Advanced Performance Modification Group (APMG) engineered the upgrade, enabling existing HondaJet owners to add the package to their current aircraft. The HondaJet Southwest dealership, part of Cutter Aviation Aircraft Sales division, is the number one HondaJet dealer in the world based on the largest number of aircraft sold and delivered. Serving the Southwest United States, Cutter Aviation is the Authorized Sales & Service Center for HondaJet with sales locations in Carlsbad, CA; Phoenix, AZ and Dallas, Texas and a network of maintenance and support facilities in Phoenix, AZ; Dallas and San Antonio Texas. This entry was posted on Monday, November 19th, 2018 at 9:36 am	and is filed under ABQ News, ADS News, Aircraft Maintenance, Aircraft Management, Aircraft Sales, Charter, CRQ News, Cutter Aviation, DVT News, Featured, HondaJet Southwest, New Aircraft Sales, PHX News, Pre-Owned Aircraft Sales, Press Release, SAT News, Technical Services. You can follow any responses to this entry through the RSS 2.0 feed. Both comments and pings are currently closed.